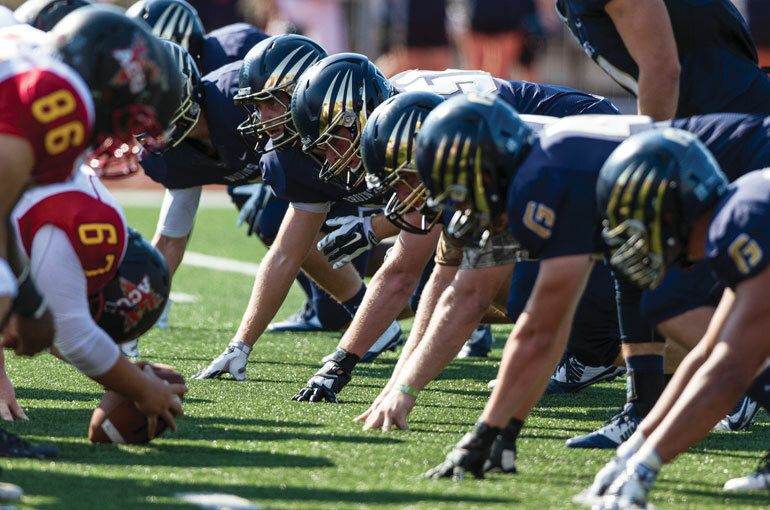 After months of construction, years of planning and more than four decades of anticipation, on Sept. 6, 2014, football finally returned to George Fox University. 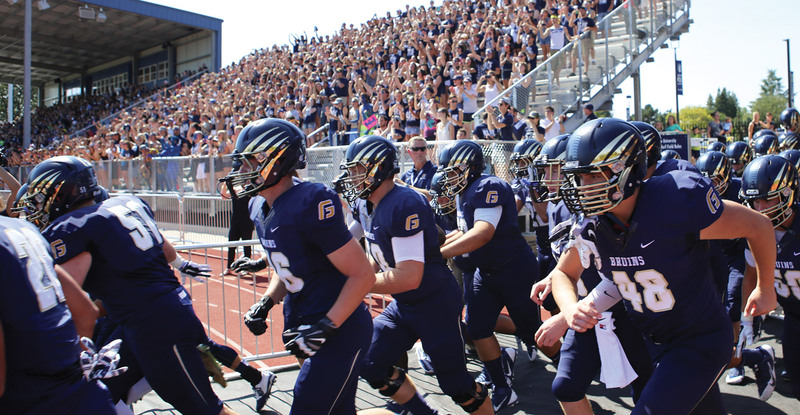 A raucous crowd of 3,659 was on hand for the university’s first football game since 1968, packing the newly built Stoffer Family Stadium for the first of many Saturday showdowns to come. But as the Bruins would learn over the course of the season, nothing comes easy on the gridiron. The result of the day was a heartbreaking 30-27 loss to NAIA school Arizona Christian that came down to the final minutes. 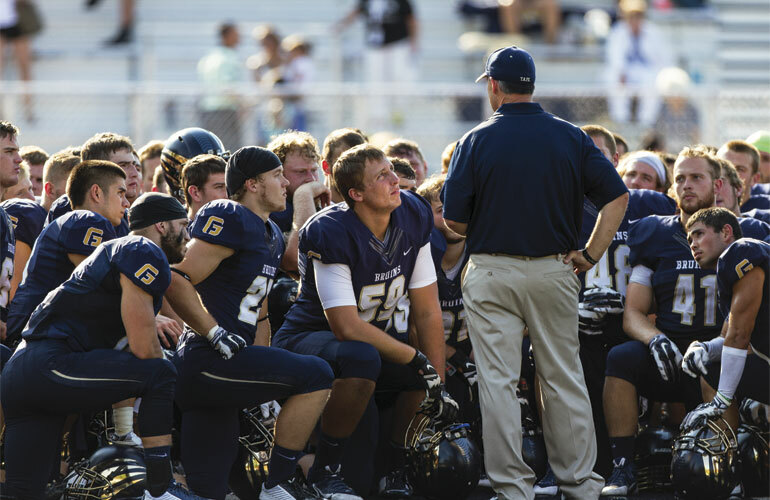 George Fox would earn its first win later in the season, a 30-12 trouncing of conference foe Lewis & Clark that featured a dominant defensive performance with two interceptions returned for touchdowns and three recovered fumbles. Still, it’s hard to compare to the anticipation, energy and atmosphere of game one. Here’s a look back at the afternoon that kicked off a new era of Bruin football. 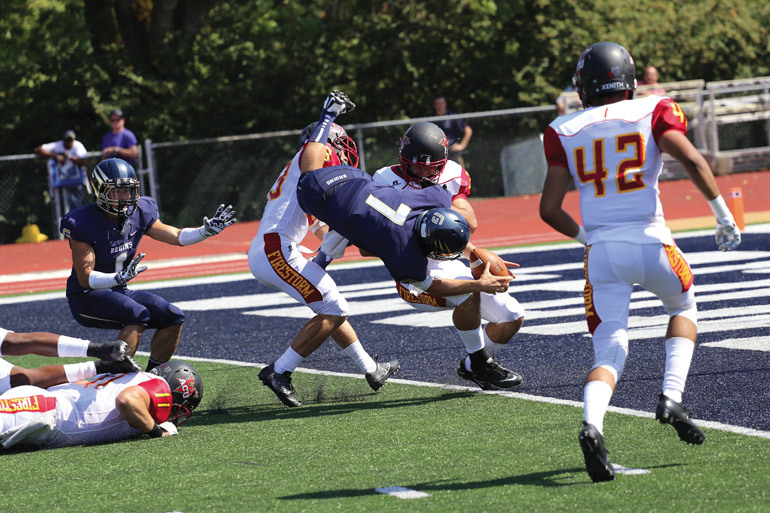 Quarterback Grant Schroeder goes airborne to score the Bruins’ first touchdown in more than 45 years – a 16-yard scramble early in the first quarter. Defensive lineman Justin Kruse and linebacker Dominick Fix-Gonzalez burn off some pregame jitters in the locker room with an impromptu dance session. Their wooden lockers were made with the help of volunteers from Friendsview Retirement Community. Their dance moves came from somewhere else entirely. 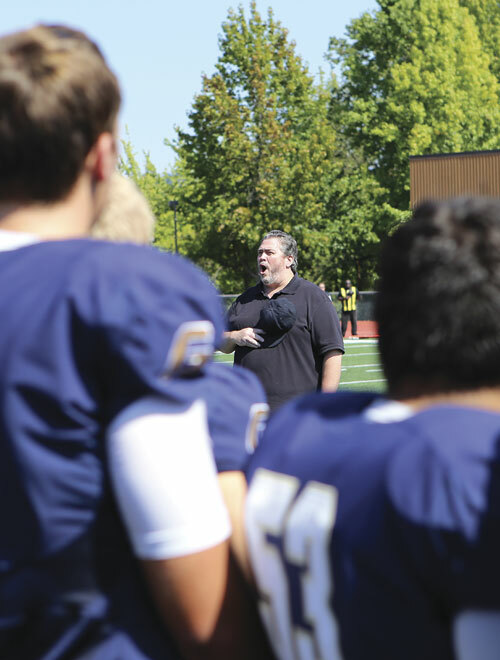 World-class baritone and George Fox alumnus Richard Zeller ('83) returned to his alma mater to perform the National Anthem. 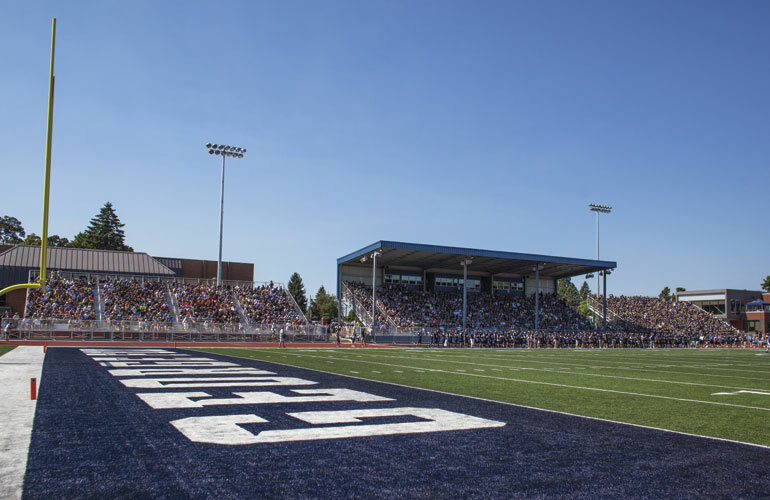 A total of more than 15,000 Bruin fans packed Stoffer Family Stadium over the course of five home games this season – easily ranking among the top Division III schools on the West Coast. 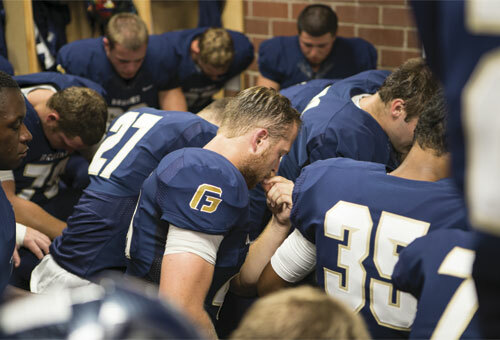 Players bow their heads for a pregame prayer – a quiet moment before being welcomed on the field by a roaring crowd. The anticipation is palpable as players line up at the locker room door before running out onto the field for the first time. 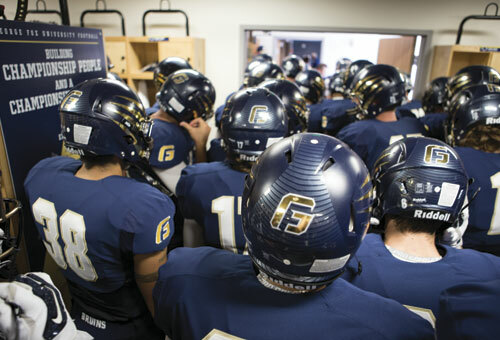 George Fox defenders line up in the trenches, ready to scuff up their shiny new helmets created by HGI – the same company that designs helmets for the Oregon Ducks and Seattle Seahawks. 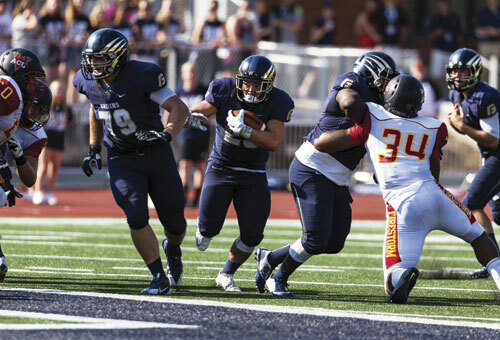 Running back John Shaffer led the Bruin offensive attack with 110 all-purpose yards. 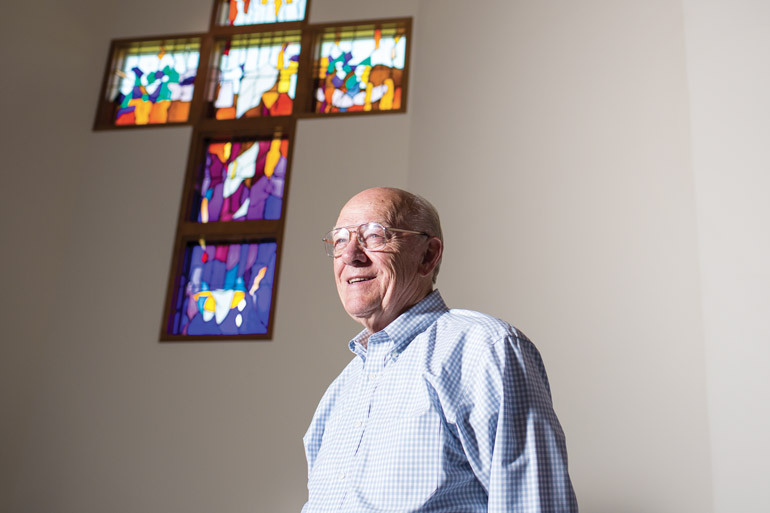 Later in the season, he’d get a rare treat for an athlete at any level: his picture in the Sept. 29 issue of Sports Illustrated. Justin Leatherman gets mentally prepared for his first game as a Bruin. 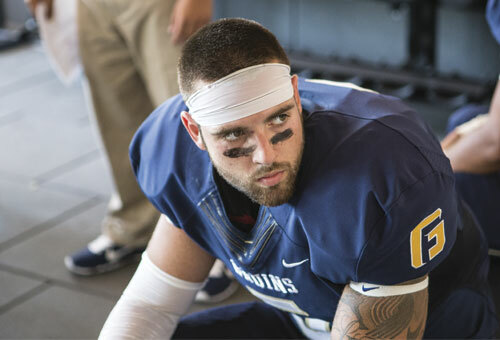 Later, the junior safety would become the first George Fox player to earn a spot on the D3football.com National Team of the Week. 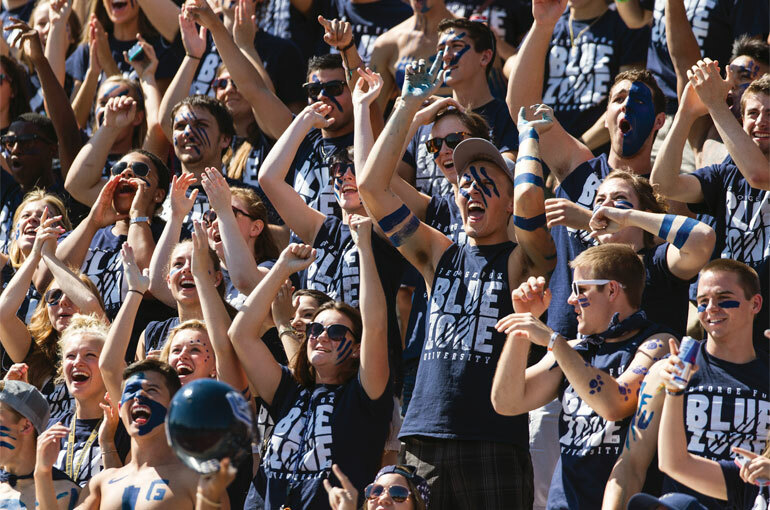 A rowdy student section had their game faces on and came ready to make some noise for the Bruins’ historic first game. 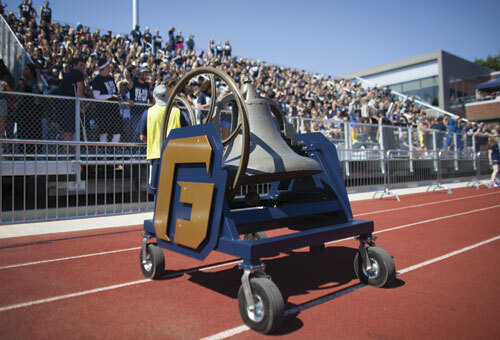 Students rung the Victory Bell five times on the day – once for every touchdown and field goal scored. The cheerleading squad keeps the student section entertained with some aerial acrobatics during a stoppage in play. 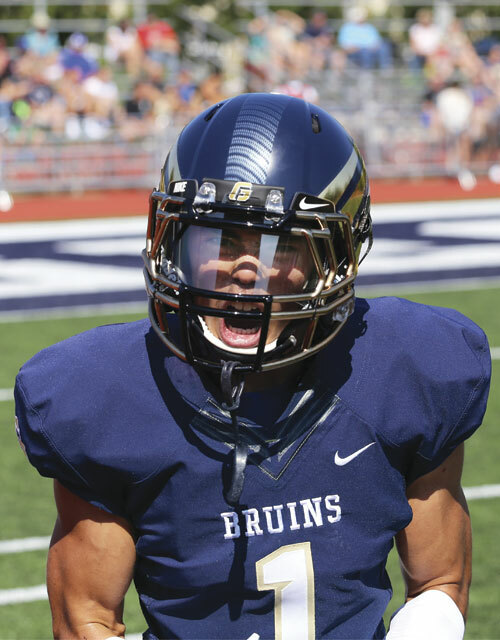 Wide receiver Lawrence Potts growls for the camera as he celebrates a successful Bruin drive. 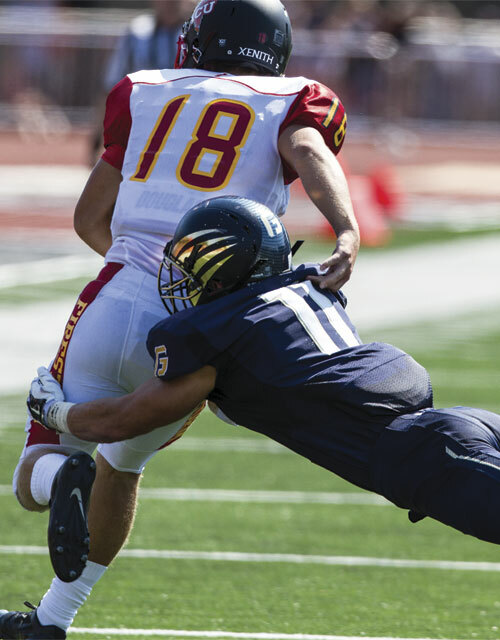 Linebacker Spencer Price dives to wrap up an Arizona Christian receiver. Coach Chris Casey waves off photographers and reporters and gathers the team on the far end of the field for a private moment after a tough defeat. It’s a practice the team would continue throughout the season, win or lose.